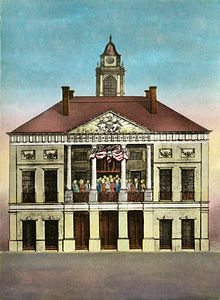 The second Amendment, proposed at Federal Hall in New York City but not ratified until about 203 years later in 1992 as the 27th amendment, had to do with Congress not being able to give itself a raise in pay without its constituents having the ability to disapprove. The increase in pay goes into effect after the following House of Representatives election. 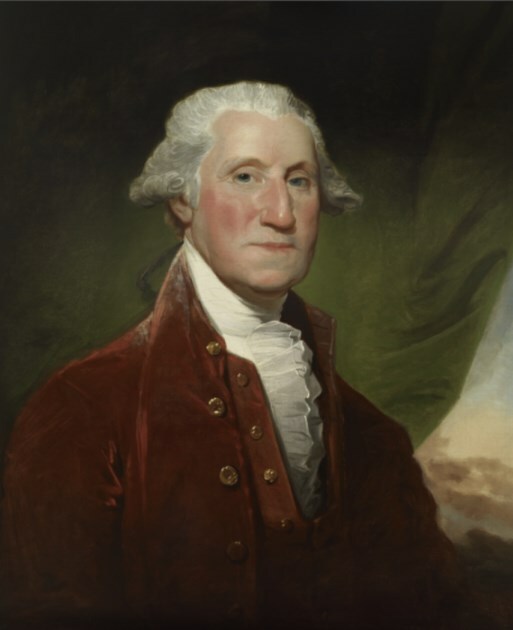 George Washington had Mount Vernon, Thomas Jefferson had Monitcello and Alexander Hamilton had the Grange. 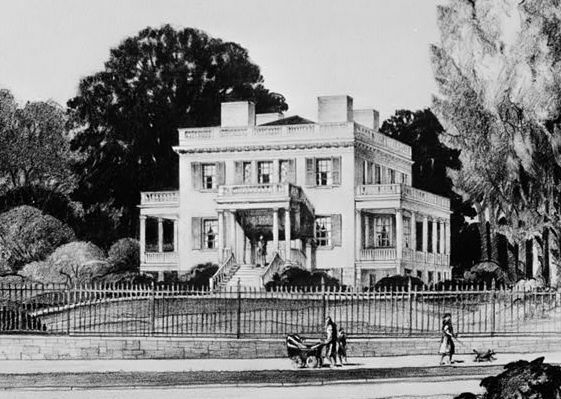 Hamilton commissioned the fine architect John McComb, Jr., (who helped design New York’s City Hall) to design a home in what was then the country in Upper Manhattan on a sprawling 32 acres. 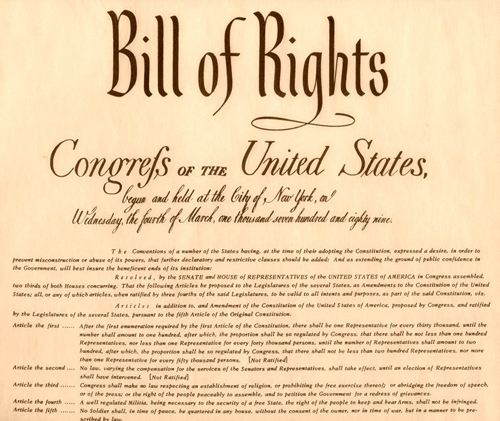 It was completed in 1802, just two years before the duelwith Aaron Burr. The home’s original placement provided for views of the Hudson and Harlem Rivers from long piazzas and numerous windows. It has since been moved twice. 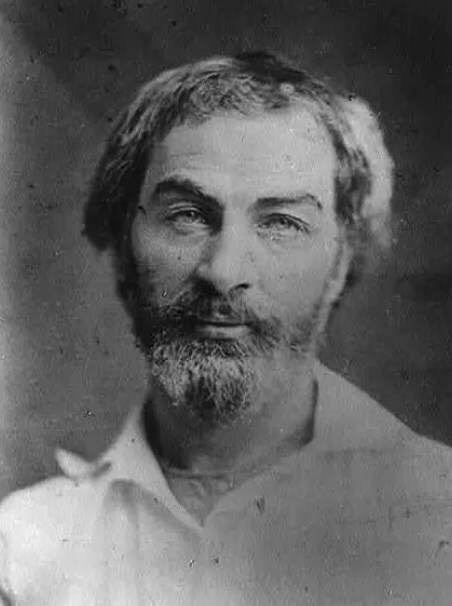 Once in 1889 and again in 2011 (at a cost of approximately 14.5 million dollars) to its present location on Convent Avenue and 141st Street where it is operated as a historic site and open to the public. You’ve seen the enormous 1851 painting by Emanuel Leutze at least in an art book if not the real thing currently at the Metropolitan Museum of Art in New York City…but have you been to the site where the crossing actually occurred? 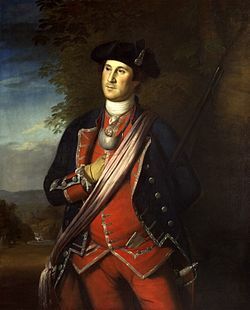 In 1776, Washington was known for crossing rivers. First it was the East River in New York in August 1776 escaping the British undetected with about 9000 people (which you’ll learn about on the walking tour) and then it was December on the Delaware River with about 2400 people, the prelude to a march to New Jersey the night before the Battle of Trenton. Although Washington crossed the Delaware on Christmas Night 1776, the summer is a great time to visit Washington Crossing Historic Park in Pennsylvania. There’s a visitor’s center, a historic village and a monument, but most importantly you can contemplate the daring maneuver at a very low point for Washington and his army at the beginning of the Revolutionary War. Here’s the website for Washington Crossing Historic Park. 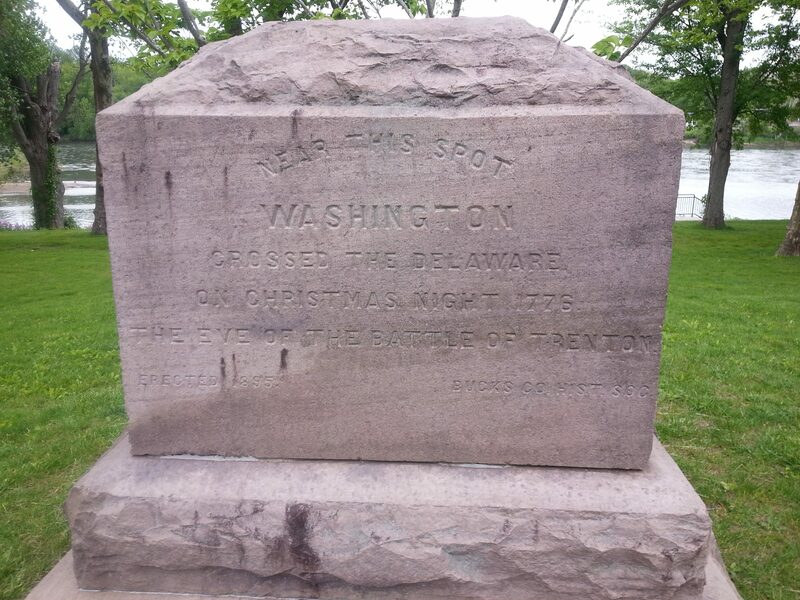 Not PRECISELY where they crossed but a maker that says, Near this spot Washington crossed the Delaware on Christmas Night 1776 the evening of the Battle of Trenton. Just as having access to technology on the go is important in modern times, surprisingly, the same can be said for revolutionary times. Both George Washington and Alexander Hamilton put current “laptop” technology to good use for their military, political and private correspondence. 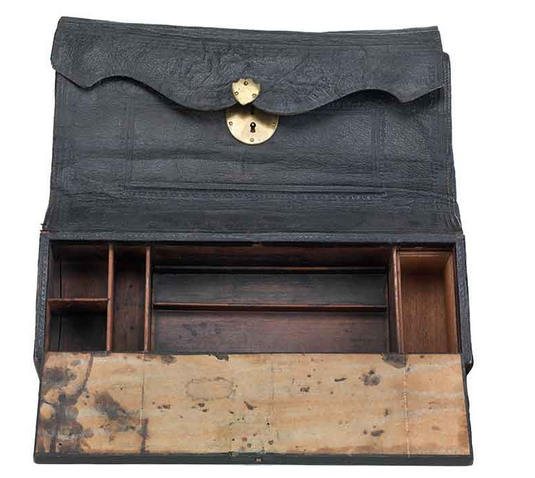 The 18th Century equivalents of laptop computers, these elegant and well-crafted portable desks provided the convenience of a writing surface along with storage compartments for pens, ink, stationary and documents. United States history was imagined and created on these laptops. 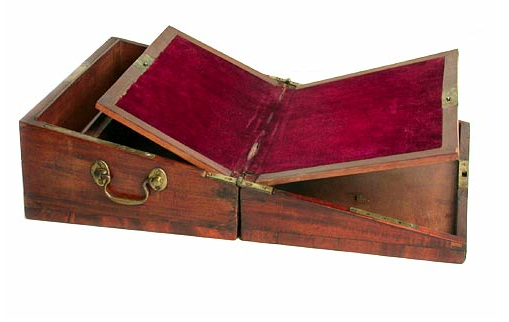 George Washington, Commander-in-Chief, used his laptop (above) during the Revolutionary War to stay in touch with army officials and Congress. The laptop is made of mahogany and black leather with storage for documents and stationary and a hinged lid which swings down to reveal a small writing surface and compartments. With over 20,000 pages of documents to his name including personal and professional correspondence, military writings, political writing, Treasury documents and 51 of the 85 Federalist Papers, Alexander Hamilton must have put these two desks to good use. 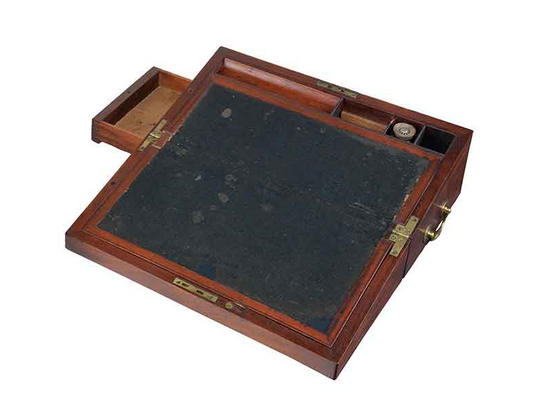 The mahogany and brass desks unfold to reveal a slanted writing surface. There is a storage compartment underneath and on the top and convenient drawers on the side(on the top desk). 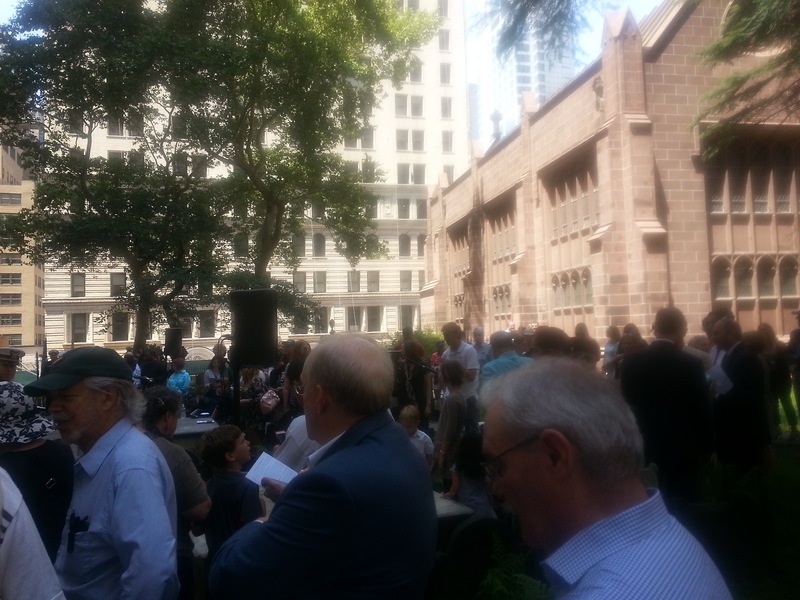 A crowd of admirers attended an Alexander Hamilton remembrance at Trinity Church in New York City on the 212th anniversary of his death. The events began with a ceremony by members of the United States Coast Guard (originally founded by Hamilton in the late 18th Century to catch smugglers), followed by speeches by Douglas Hamilton, 5th great grandson and Rand Scholet, founder and president of the Alexander Hamilton Awareness Society. After the ceremony, inside Trinity Church, Richard Brookhiser, author of the highly recommended 1999 biography, Alexander Hamilton, American (as well as Founding Father: Rediscovering George Washington), was awarded the first ever Hamilton Legacy Award by Rand Scholet. Brookhiser gave a powerful speech titled “Alexander Hamilton: The Man Who Made America Prosperous”. Due in large part to Lin-Manuel Miranda’s sensational, Hamilton the Musical, a large crowd assembled to honor Alexander Hamilton. The first Secretary of the Treasury and Revolutionary War hero died 212 years ago and was buried in the cemetery along with his wife Elizabeth Schuyler Hamilton. 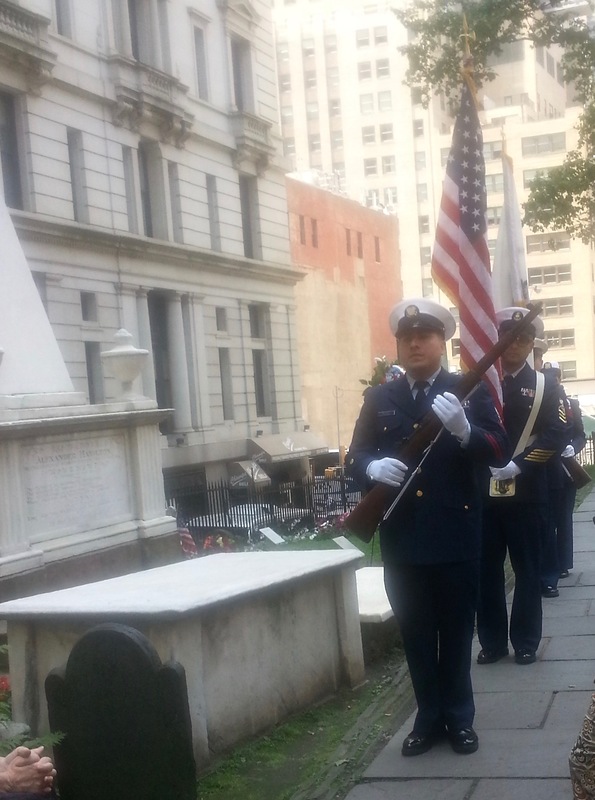 A ceremony by the US Coast Guard preceded speeches at the gravesite. 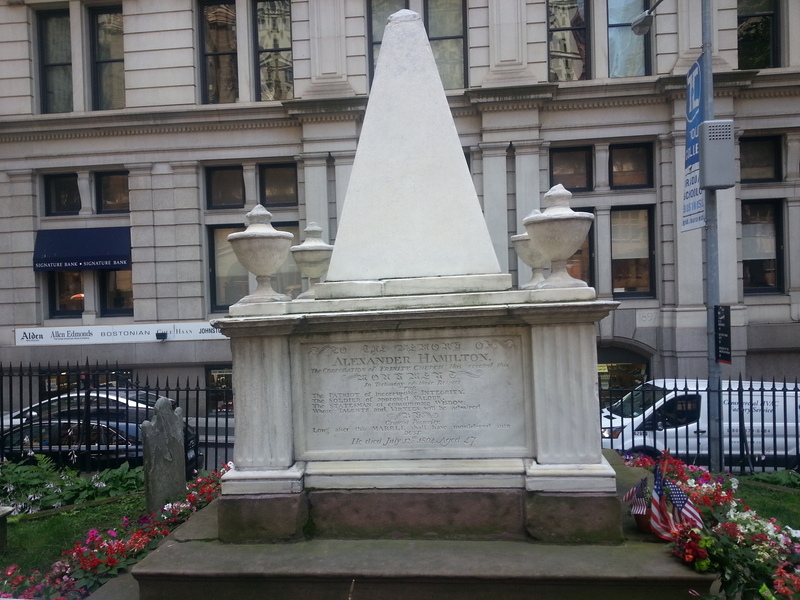 The gravesite of Alexander Hamilton. New York City was the key city in the Revolutionary War and the location of so many seminal sites and events in the founding of the United States. Explore this history in the “The Revolutionary Tour: Washington and Hamilton in New York City”.